Whazzappen this weekend? Opportunities to see a lot of prints, for one thing. Here are some of the things we'll be checking out. Candace Hicks, Composition in Orange, silkscreen, 2011, 20" x 25"
PRINTX, a juried show of prints featuring work by Ann Johnson, Anna Mavromatis, Brian Johnson, Candace Hicks, Cathie Kayser, Elvia Perrin, Evan Rottet, Jesus de la Rosa, Joan Winter, Joelle Verstraeten, Kathy Trice, Kim Cadmus Owens, Margaret Craig, Miguel Aragon, Nick Mendoza, Orna Feinstein, Ricky Armendariz, Sandra Fernandez, Teresa Gomez-Martorell, and Terri Thoman at the Museum of Printing History, 6 to 8 pm, runs through September 14. Lots of prints by lots of printmakers. A catalog is available and can be previewed online. The 2013 UHCL Graduate Student Exhibition with art by Shara Appanaitis, Christina Carfora, Tamara Foster, Yocasta Gonzalés, Michele Humphries, Sarah Langston, Brandie Minchew, Sherrie Schaeffer, Tess Stilwell, Jennifer Windham and Jim Livesey at the UH Clear Lake Gallery, 5 to 7 pm. Lots of ceramics and photography on view for anyone on that side of town Thursday evening. top:Tony Garbarini at galleryHOMELAND, 6 pm to 10 pm. GalleryHOMELAND is hosting sculptor/installation artist Tony Garbarini. 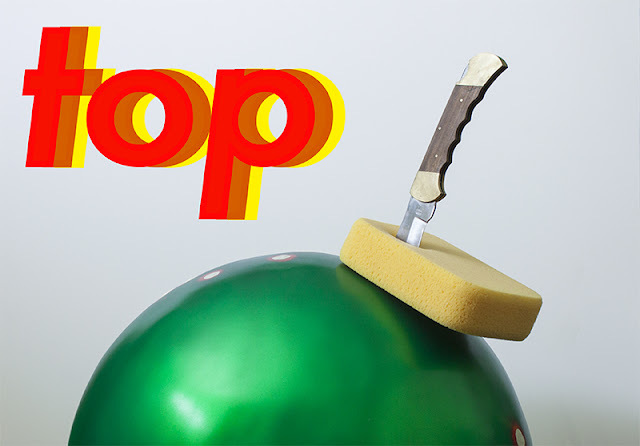 I hope there will in fact be a green bowling ball stabbed with a knife in this show. Steamrolled III featuring Sean Starwars and many other printmakers at Peveto, 4 to 6 pm. 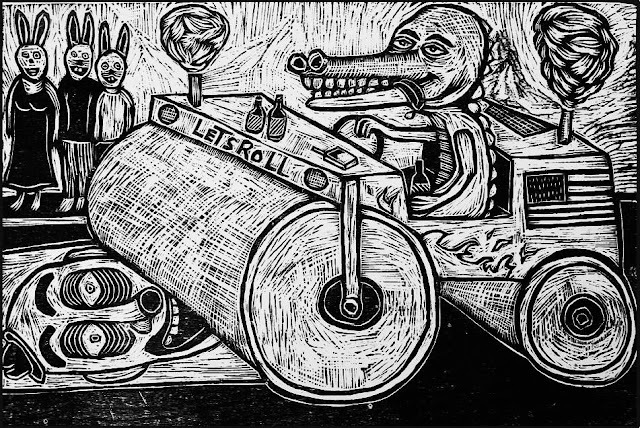 Did you miss the steamroller printmaking event at St. Arnold's brewery a few weeks back? Yeah, me too--but now you can see the prints made there at Peveto. I anticipate fun.